Sophisticated yet sweetly simple, these grown-up candies reach the peak of the carmelier's craft. Two cows walk into a bar at Happy Hour... Could be the start of a very bad joke—or some very good caramels. Jon Sue and Jason Alm's confections are the latter: smooth and gently chewy, their caramels are made with local, organic cream and butter and locally distilled whiskey and absinthe. Fascinating complementary flavors like black- and applewood-smoked salts, anise, fennel, and hyssop build and intensify their flavors, and they use syrup made from organic brown rice instead of corn for a richer, toastier taste. Somehow both sophisticated and sweetly simple, these are the peak of the caramelier's craft. They're very hard to share, so you may want to order a double. Made in Seattle. —Absinthe: Buttery caramel infused with artisanal Seattle absinthe, anise, fennel, and hyssop and finished with a touch of black salt. —Whiskey: Smooth, buttery caramel made with artisanal Washington State whiskey and finished with a sprinkling of Yakima applewood-smoked salt. —Fleur de Sel: A classic, rich caramel with a touch of mineral-y French sea salt. 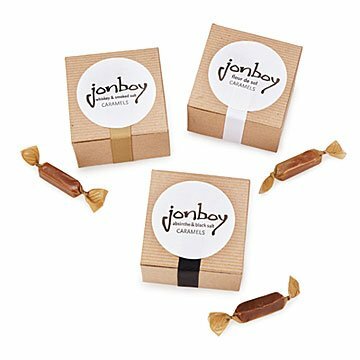 In 2009, Jon Sue and Jason Alm came together with the idea of making the finest small batch caramels using the very best ingredients available. They created an artisan confectionery company that is based in the Ballard neighborhood of Seattle, WA. What started out as a side business, soon became a full time endeavor frequenting the bustling farmers market scene around Western Washington. One of the aims of Jon Sue and Jason Alm’s company is to use ingredients grown and produced close to home such as Pacific Absinthe in their Absinthe with Black Salt Caramels. Those ingredients paired with local cream and butter, organic brown rice syrup (no corn syrup!) and organic cane sugar all come together to make the finest textured and tasting caramels out there. These are goood if you love caramels. I actually liked the anise flavor best and I'm not a huge black licorice fan. Well done. Nice gift. Perfect to split between 3 co-workers. I love caramels and these are delicious. They are full of flavor, soft and do not really stick to your teeth, but sort of melt in your mouth. I love the Whiskey and the Salted Caramel. The Absinthe well???? I'll probably buy more of just the Whiskey or Salted ones however. This variety pack makes a great gift if you don't want to give chocolate. Much better than a fruitcake! Best caramels I have ever tasted! I originally found these at a farmers market in Seattle. They are like none other. I would but this again for my dirlfriend, she loves sweets! There's nothing bad about a delicious caramel that tastes like booze. So yummy! I am definitely buying these again! Two or three are a nice sweet treat in the evenings.